Each and every year the Epsom Derby (aka the Investec Derby, and the Derby) is one of the most highly anticipated events of the flat racing season. It’s classed as ‘one to watch’ for both casual and serious followers of horse racing and is held on the first Saturday of June each year at the Epsom downs racecourse in Surrey. The race is named after the 12th earl of Derby and prize money for the first ever Derby was £1,065. Serious money at that time. The race is for three year old horses and distance 1 mile 4f 6y on a left hand track. The inaugural Derby took place in 1780 which gives you a clear idea of how much history is attached to the race and how much winning it means to every jockey, trainer and owner with an involvement in flat racing. In the 1800’s and beyond the Epsom Fair which at the time coincided with the Epsom Derby was a big draw, with a focus on entertainment offered by musicians, clowns and magicians. Charles Dickens famously attended the event in the 1850s and a famous painting ‘Derby Day’ by William Powell Frith brings that time to life. The event has since fizzled out though. The Epsom Derby is one of the five Classics, all of which are races from a similar time period which are seen as representing the height of achievement in flat racing. For a horse to win more than one of these races marks it out as being exceptional. The races that make up the British Classic races are: 1000 Guineas, 2000 Guineas, Epsom Oaks, Epsom Derby and St Leger Stakes. 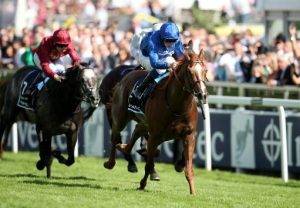 The Epsom Derby is also part of the Triple Crown, which consists of the 2000 Guineas, Epsom Derby and St Leger. Wartime aside, the Epsom Derby has always been held at Epsom racecourse and the reputation of the race has travelled around the world, where there are regional versions of the Derby. Derby Italiano, the Deutsches Derby, the Irish Derby and the Prix du Jockey Club and others all took their inspiration from the event. Lester Piggott’s legendary reputation was in part cemented due to his performance in the Derby. He’s won the event 9 times, including such legendary rides as Sir Ivor and Nijinsky. The 2018 winner was 16-1 Masar riden by William Buick and trained by Charlie Appleby. Odds-on favourite Sacon Warrior underperformed on the day, placing forth. It was the first Derby win for the Godolphin stable.